Against the backdrop of mounting hardships in the Confederacy, unrest grows even in the nation’s capital of Richmond. Many of the city’s white women, struggling to provide for their families as their husbands and sons march and fight in distant places or are otherwise employed in the war effort, have reached a breaking point. Today at Richmond’s Belvidere Baptist Church, women working in local ordnance establishments and wives of men laboring in the Tredegar Iron Works meet to discuss a shortage of food in the city. Feeling desperate, the women decide to gather at Capitol Square tomorrow and request an audience with Virginia governor John Letcher, whom they hope will respond to their pleas for help. Gathered in the square on the morrow, their request is denied by the governor. 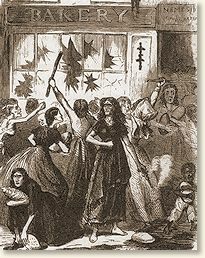 Enraged, the women begin looting food from downtown shops. Confederate President Jefferson Davis emerges from the capitol building to address the women. Accounts of what happened next vary, with some noting that the president emptied his pockets of change and told the women that was all the money he had. Others recount that Davis promised to make certain that the women received rations, and that with his assurances the rioters calmed down. Still other accounts indicate that the riot was not truly quelled until the threat to dispatch home front guards was issued by either the governor, the president or a Confederate military official (again, accounts vary). Regardless, a show of military force was displayed, whether or not the crowd was threatened with harm. …. Well, I will tell you something of the scene which I witnessed today. The women, said to be soldiers’ wives, met this morning at 8 o’clock. Somewhere between 800 and 1000, as near as I could say. They came down by the capitol square, cross[ed] Main, went on Carey Street, went to a large provision store. They went in and got quantities of bacon, flour, candles, soap, brooms, beef, lard, butter and everything they could get, broke into a shoed shop by the side of it, got shoes, boot[s], any quantity. They then went on Main Street to a shoe shop, cut and pried, broke down windows’ frames, broke out glass and went in at the windows, got large quantities of shoes, calicoes, shawls and any and everything they could get and went on a great many streets and done the same. … And Jeff Davis made a speech about the wind-up of the affair. He told then that anything he had they was welcome to if they needed it, and he made a good speech and requested the crowd to disperse, which they did when he got through with his speech…. Something very sad has just happened in Richmond – something that makes me ashamed of all my jeremiads over the loss of the petty comforts and conveniences of life – hats, bonnets, gowns, stationery, books, magazines, dainty food. Since the weather has been so pleasant, I have been in the habit of walking in the Capitol Square before breakfast every morning. . . Yesterday, upon arriving, I found within the gates a crowd of women and boys – several hundreds of them, standing quietly together.
. . . The crowd now rapidly increased, and numbered, I am sure, more than a thousand women and children. It grew and grew until it reached the dignity of a mob – a bread riot. They impressed all the light carts they met, and marched along silently and in order. They marched through Cary Street and Main, visiting the stores of the speculators and emptying them of their contents. Governor Letcher sent the mayor to read the Riot Act, and as this had no effect on the crowd. The city battalion came up. The women fell back with frightened eyes, but did not obey the order to disperse. The President [Jefferson Davis] then appeared ascended a dray, and addressed them. It is, said he was received at first with hisses from the boys, but after he had spoken some little time with great kindness and sympathy, the women moved quietly on, taking their food with them. General Elze and General Winder wished to call troops from the camps to ‘suppress the women,’ but [Secretary of War James] Seddon, a wise man, declined to issue the order. While I write women and children are still standing in the streets, demanding food, and the government is issuing to them rations of rice. The Break Riot is a sign of things to come. Henceforth an internal war grows within the Confederacy as food and supplies dwindle and economic hardship increase with each passing month. Richmond is not the only Southern city seething with unrest for the remainder of the war, as Confederate officials battle home front discontent for two more long years.